Wishing you all and your family a very Happy Gudi Padwa. 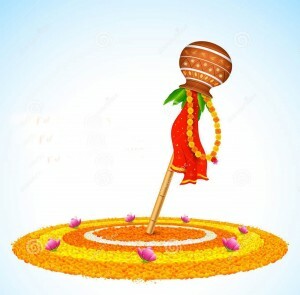 Gudi Padwa festival is celebrated as the New Year by Maharashtrians all over the world. It is also the beginning of the New Year as per Hindu Calendar. I am not going to talk today about what is this festival and how it is celebrated, but I am going to share some scientific significance of rituals performed today. All the rituals we perform comes from the belief system we carry. This belief is programmed in us since our childhood and we blindly follow it. Yesterday, while talking to a Maharashtrian friend, I casually asked the significance of hosting a Gudi. He tried to convince me saying some rituals are to be followed with faith for prosperity and well-being. I wanted to understand the significance of elements of Gudi and the science behind it. My friend suggested me to talk to his ‘Aaji’ (grandmother) and my journey to explore Gudi began. Aaji is around 92 yrs old but very sharp. She was excited to explain me and resolve all my doubts. The elders, specifically grandparents and their generation, though not as educated as we are today, but have depth knowledge and wisdom. Aaji could even talk to me about energy fields and science. I am sure, our kids, from engineering and medical, will fail to answer the way Aaji could. What do 9 Elements of Gudi Symbolises? There are 9 elements used to host a Gudi on a Gudi Padwa. Below table list all the elements. Now let us see the spiritual significance of hosting the Gudi. This is what most of us miss on. It is very important to understand the spirituality in hosting the Gudi. This understanding increases the energies generated through the mind in the entire process and benefits the environment around us. Desk (पाट) Covers the subtle frequencies on the floor, activates the earth energies. I have seen many people hosting the Gudi on the windows. This will miss out the Earth energy. Silk Sari (जरीची साडी) Emits frequencies in the downward direction covering the lower plane. Neem Leaves (कडुनिंब) Emits frequencies in 8 directions and 16 zones of Vastu are purified with Neem. Neem has the natural properties of healing body and space. This covers the space (middle plane). Copper Pot (कलश) Emits frequencies in the upward directions covering the upper plane and sky. Copper element properties are efficient enough to cover the energies till the sky. Hence copper is also used in Vastu rectifications. 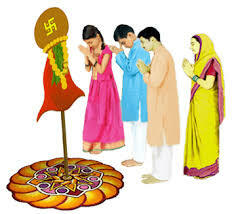 When the hosting of Gudi is performed by the family members, their mind power is also activated in the entire process and a higher level of the energy field is generated around Gudi. This Energy field Energise the Gudi and is programmed by the intentions of the family members. It is very important to understand this and perform the ritual with complete understanding and well-planned intentions. The feeling of Gratitude is born in the Heart while initiating the process. With the knowledge, understanding, pure and planned intentions, you can achieve the highest level of spirituality and energy field in and around your home. 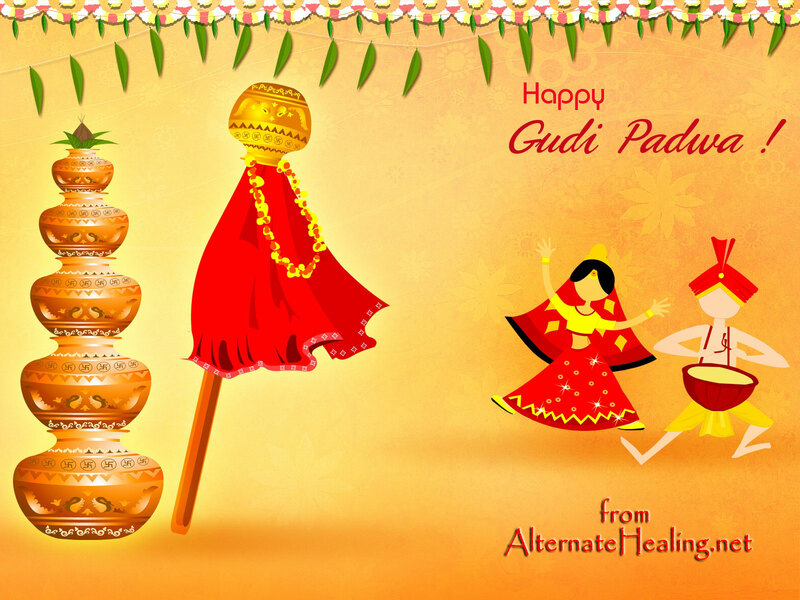 Wishing you all once again a Happy Gudi Padwa! For any sort of clarifications of the product, orders, price, shipping charges, etc. 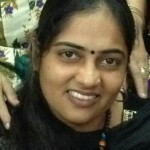 or guidance and counselling, mail to alternatehealing.net@gmail.com or call 09867-152220. Follow me on Facebook for regular updates.